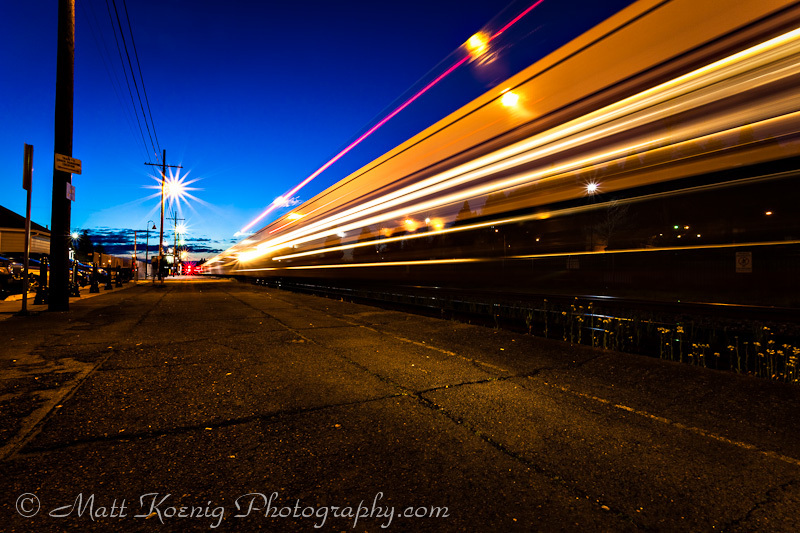 I was out doing some evening photography with a friend and we decided to go shoot down at the Eugene train station. It was empty at first but then people started showing up with their suitcases and we heard the yell of the train horn way off in the distance. Then my creativity kicked in and I imagined a shot in my head. Quickly I setup my tripod and framed up the shot. I set my camera on manual and set a long shutter speed. I wanted to capture the sense of motion as the train pulled into the station. The blur and stream of light from the train captures this just as I had imagined it in my minds eye. So Happy Monday! Are you traveling anywhere this week? I love the contrast of the golden action against the blue sky. Yeah, that twilight sky is always a really nice light.